For me, exposing my kids to the wondrous world of nature has always been my top priority ever since I became a Dad. Especially since half of their time are essentially spent looking and swiping at screens these days. A child’s experience in the natural world can be as small as helping to plant a seed, visiting the numerous parks we have here in Singapore, or just pausing and trying to listen for the sound of a bird on the way to school. Nature has been widely noted to play a key role in our mental health, so it probably comes as no surprise that it also affects the way we, and our kids, learn. Sadly, such a connection with nature has been slipping away from many of us – and especially so for the world’s children. So bringing the monkies to explore various parks and nature attractions is what I love to do whenever the weekends roll by. We paid a visit to the new Sungei Buloh Wetland Reserve Extension and I was pleasantly surprised by the wide array of family-friendly facilities like the Junior Adventure Trail and Mud Experience, where kids are able to step onto the mudflats during low tide and get up close with mudskippers living in the mud! Young kids need experiences that support their natural affinity with nature and which are directly accessible to them - rather than just reading about it from a book or watching the Discovery Channel. Without an opportunity to experience, children will not have an opportunity to develop appreciation or connections with Nature. Just like how many kids are more familiar with processed food than natural food these days, it is increasingly unfortunate that most of them have never seen a vegetable growing, or even genuinely believe that vegetables come from the supermarket. Which is why every kid should know where his/her food comes from, and have at least a basic knowledge of how to plant and nurture a seed to its tasty fruition. 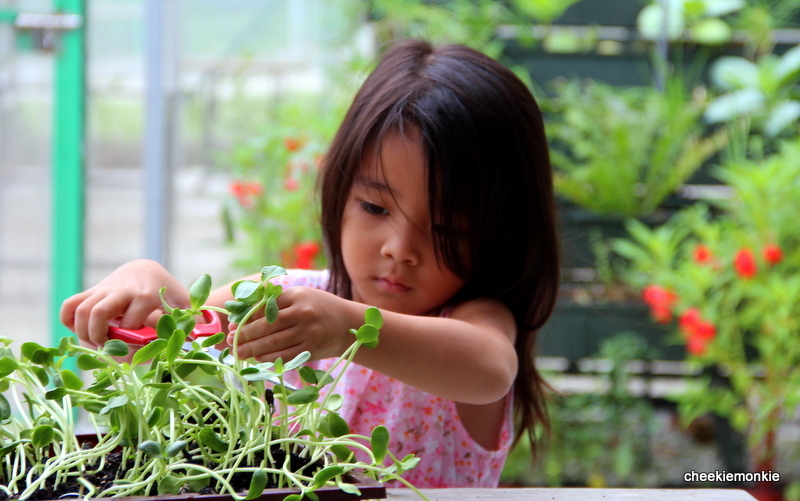 Because teaching them how to garden means imparting an important lifeskill, one that would serve them well as they grow up. Personally, I hope to see more kids-friendly nature attractions in Singapore. Of course, parents need a play a part as well so I wish to see more parents taking the initiative to promote nature learning that is spontaneous and unstructured, using nature as the source of learning and inquiry. Hopefully, school work will also include a more active, hands-on approach to nature. Only when children have daily opportunities to experience the land, water, and living things in their surroundings will they develop both an attachment to and an understanding of their world and of other species. Because at the end of the day, this is MY SPARK. Everyone has got a spark. An inspiration, an aspiration, an idea. It ignites possibilities and where it takes you can be amazing. DBS believes that a simple spark could lead to something bigger and more meaningful but everything starts with a spark. Do you have a dream or passion? Head down to www.dbs.com/spark to submit your spark just like I had done. No, this is no contest or giveaway because it is all about igniting possibilities and sparking joy. No matter how big or small your dream or passion is, share your spark through the site and DBS may just make it happen! So, this is my passion. What's yours? Share them with the hashtag #MySpark or find out more at www.dbs.com/spark.